When you own a cat, chances are at some point your cat will acquire worms. 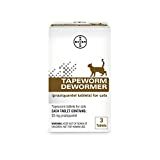 Dewormers allow you to rid these worms, often tapeworms, hookworms or roundworms, from your pet. However, there are many factors to consider when you purchase a dewormer. Some pet owners prefer to use a primarily natural dewormer, which takes more time to heal the animal. Other owners are not concerned about natural ingredients and want their animal back to normal as quickly as possible. And rightly so, because worms will cause major irritation to your cat’s intestinal lining (Source). Whatever you decide, take the time to read our reviews of the most popular cat dewormers here. With our review guide, you will feel confident that your cat is taking the best deworming option possible. Please note that an ideal dewormer treatment will depend on your cat’s age, weight, and other factors. First, there is Bayer’s Tapeworm Dewormer. It is important to take note immediately that this dewormer only takes tapeworms out of your pet’s system. This product comes in tablet form. By choosing a dewormer in tablet form, you must choose to either give the cat the pill orally, which can be rather difficult, or crumble the tablet to mix with your cat’s food. Remember, giving cats oral pills is a challenge, as you often have to shove the pill to the back of their throat. If you crumble in on their food pickier eaters will simply not eat the food. Keep in mind, you can also give a cat the oral pill mixed in with an additional food. Many cat owners tuck the pill into tuna in order to entice their cat to eat it. This particular tablet has excellent flavor and thus is eaten by most cats. An extra cat-owner tip? Mix some water in with the crushed pill to dissolve it before adding to food. These pills are for cats over 6 weeks of age. This is a standard part to any dewormer. Cats under the age of 6 weeks cannot take dewormers. Pyrintal’s dewormer meets all your deworming needs. This pill deworms your cat from tapeworms, roundworms, and hookworms. This means that if you know your cat has worms but are not sure which kind, you can use this dewormer to cover the major bases. This ensures that your cat will be safe and the worms will be gone. Once again, this is an oral tablet. It can be crumbled and mixed with the food or it will have to be orally given to your cat. As is standard, this pill can be given to any cat over 6 weeks of age or over 2 pounds in size. This pill has very specific instructions for cats of different weights, so ensure you read the instructions very carefully before administering. Finally, this dewormer comes with four pills, which means that you can give this pill multiple times, as long as your cat is under 16 pounds. This can be a huge bonus, in case you have multiple cats or if the worms are reoccurring. Another excellent deworming option is the NaturPet dewormer. This dewormer works with a slew of herbs instead of any chemical or medicines to remove the worms. A major bonus for this dewormer is the number of worms it dispels. It boasts the ability to deworm pinworm, roundworm, giardia, tapeworm, whipworm, and ringworm in both dogs and cats. This dewormer is made up of wormwood, black walnut hull, black seed, sage leaf, fennel, and papaya leaf. These all natural ingredients are completely safe for your pets. Another bonus of this dewormer is that it is a liquid. This means that you can add it to food, squirt it down the pet’s throat, or even add it to a treat without your pet noticing. So why doesn’t this top our list as the best dewormer for cats? Because the treatment period is a much longer one. You must give it to your pet two times a day for a full week after all worm signs are gone. This length of time is simply not appealing to many pet owners. It requires a significant amount of attention to detail in order to be 100% effective. Excel has developed their own dewormer. 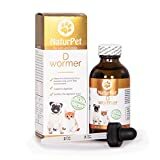 This dewormer is only for roundworms, making it less enticing than the other dewormers on our list of the best. This is another liquid dewormer, making it easier to mix in with other foods. It’s also a flavored dewormer, allowing the cats to enjoy the flavor. If your cat does not take pills well, or if you have never administered your cat pills, this is an excellent option for you and your pet. The active ingredient in this dewormer is piperazine citrate. While this is very mild and delivered in small doses, it is incredibly important to note that this means the roundworms will be paralyzed and that is what ultimately kills them. Again, this dewormer should not be given to any cats under the age of 6 weeks. This can cause very serious medical concerns. However, there are no known side effects to this dewormer, making it safe for your cat. 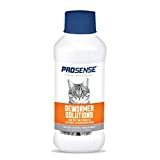 Pro-Sense’s Liquid Cat Dewormer is the last dewormer on the list. This is another dewormer specifically designed for roundworms. Again, this is an oral liquid dewormer, which should be easy for most cats to take. Simply add it to their food or to a bowl of warm milk and they should take the medicine. This dewormer only fights roundworm. 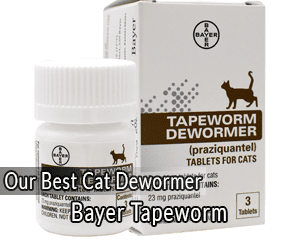 One of the most common types of worms for cats to have is tapeworms, so it is important to note that these dewormers will not get rid of tapeworms. Be cautious in how much you give. There are two sets of dosages described, depending on whether you give the dosage with food or on its own. Once again, remember that this medicine can only be given to cats older than 6 weeks of age. Giving any dewormers to cats under the age of 6 weeks can be very dangerous. When purchasing a cat dewormer, there are several major things to consider. The primary decision revolves around the size of your cat and the dosage size. Make sure to thoroughly read about the dosage requirements based on the size of your cat. If your cat may require multiple dosages, you will want to make sure the size of the product is enough to administer the correct dosage. There are many types of worms which can impact your cat or dog. Below are the most common worms found in cats and their side effects. Roundworms are found only in the intestines of the cat, and much later in the lungs. Often your cat will not show signs at first. However, once the cat begins to show signs, you must pay close attention. Cats with roundworms will often show signs of vomiting, lack of appetite, bloated stomach, dull fur, and perhaps coughing. Coughing is the worst symptom in the list, as it means that the symptoms have far surpassed the norm for roundworm. Roundworm, however, can also be incredibly painful. If you notice your cat is more sensitive to being picked up or handled than normal, you may want to consider a treatment. Hookworm is another worm found primarily in the intestines. Like roundworms, if the disease progresses enough, the cat will begin coughing. Initially, with hookworm, your feline should only experience diarrhea, dark and tarry stool, and constipation. As the infection continues, the cat will experience pale gums and ears as well. The final symptom of hookworm is coughing. Ultimately, if you have a cat which is regularly coughing, you should consider taking him or her to your local veterinarian. The next worm, and possibly the most common for cats is tapeworm. Tapeworms are caused when the cat ingests either a flea or rodent infected with tapeworm. The initial symptoms are pieces of worms spotted around the rear of the cat. This is an incredibly obvious sign that your cat has tapeworm. If your cat is an outdoor cat and you do not notice this symptom, other symptoms are diarrhea, bloody stool, bloating, or weight loss. Once again, if you notice your cat is regularly coughing, you should have him or her checked out by your local veterinarian. Tapeworms, remember, eat the nutrients off of their hosts. Be very cautious. If you notice your cat losing an extreme amount of weight, or looking “unhealthy”, check their rear area for pieces of worms. Giardia is a fairly common worm found in kittens or puppies. It can be difficult to get rid of giardia, as it spreads to other animals quickly. Be sure to talk to your veterinarian and use a dewormer made for giardia. Giardia is often identified through loose stool and weight loss. However, if left untreated in puppies and kittens, giardia can lead to death. If you acquire a new kitten or puppy experience diarrhea, make sure you have the diarrhea tested. This disease also quickly spreads, so have your older pets checked immediately as well and consider contacting the breeder where you got your kitten or puppy. Many pet owners prefer natural options in regards to any medicine or foods for their pets. Many processed foods or chemical-heavy medicines cause more issues in the long run. However, often natural options end up costing more money. They also often require multiple administrations on a regular basis. These details can add up and cause more frustration for pet owners. Make sure you read thoroughly the ingredients on natural medications. It is not uncommon for pets to have allergies to certain ingredients. It is also common for companies to list an unnatural ingredient as natural. Be sure to read the instructions on the bottle before purchase. Some dewormers can take many weeks to effectively remove worms from your pets. If your pet is a higher weight, you may want to purchase multiple bottles of the dewormer. This is especially true with the natural dewormers as they take much longer to effectively help your pet. Additionally, if your pet is of a low weight, be cautious in how much you give your pet. Read on to learn about the normal side effects of dewormers, so that you can be prepared to protect your pet. A detail to consider is reactions other pets have had to medicines. Most medicines do not have any reactions from the recipients. The most common reaction for any dewormer is vomiting. If your pet begins vomiting, immediately cease dispensing it. A pet may also experience a lack of appetite. This is typically not an issue, although it can be if it means they will not take their medicine. Before providing a second or third dose, be prepared with your pet’s favorite foods on hand. This will ensure much better delivery of the medicine. Many pet owners tuck the medicine into a roll of meat, tuna, or peanut butter. Ultimately it may be best to discuss the side effects of specific medications with your veterinarian. Based on the side effects and your vet’s prior knowledge of your pet, your vet can help you determine your best option. If you do give your pet a medication and the pet has an adverse reaction, make sure you contact your veterinarian immediately. Even if the reaction is not listed as a reaction to the medication, every pet reacts differently to new medicines. One of the most important decisions is following your veterinarian or another veterinarian’s recommendation. While it can be easy to take your pet’s health into your own hands, it is incredibly important to take a veterinarian’s advice. All of the medications on this list are approved by veterinarians. However, be sure that your pet is suffering from the type of worm you expect before you begin treatment. Consider your cat’s age before administering any sort of treatment. Young cats or particularly old cats can truly suffer from side effects. First of all, no cat under the age of 6 weeks should ever be given any sort of dewormer. A dewormer can cause incredibly terrible effects on the stomach of a young cat. Likewise, an older cat can suffer greatly from the intensity of the medication found in a dewormer. 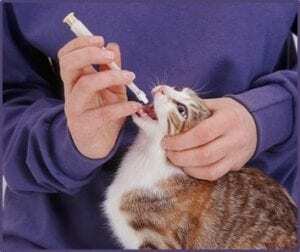 Before giving a young or old cat any sort of medication, speak with your veterinarian about an effective treatment plan. A difficult choice can be whether to choose a liquid or tablet dewormer. This is especially difficult if you have never given your cat a medicine before. A liquid dewormer is typically easier to administer. It is simply easier to mix with food or liquids. Meanwhile, a tablet can be crushed into a powder and mixed with water before added to a food. It can also be added to a substance, like peanut butter or tuna, or straight given orally. Each of these options is viable, however, you must know your pet’s individual preferences. If you have never administered a medicine, it is easiest to administer a liquid dewormer. As you debate the best dewormer for your cat, we strongly encourage you to choose a liquid dewormer. This is the top-rated dewormer for a cat which has never received a medication before. Likewise, we strongly encourage you to speak to your veterinarian before choosing a medication. Your veterinarian has specific experience with your cat’s age and size. This medical perspective cannot always be held by you, the pet owner. Leave us some comments about your favorite cat dewormers below!